Hallmark and Freeform aren't the only cable networks going all in on Christmas. On cable TV, it’s beginning to look a lot like Christmas—and not just on Freeform’s 25 Days of Christmas and Hallmark Channel’s Countdown to Christmas, which for the past decade have dominated the season by airing round-the-clock holiday content throughout December (Hallmark has been at it since Oct. 27). This year, several of their cable competitors, who had previously stuck to occasional holiday specials or movies, have ramped up their own holiday offerings in hopes of getting a bigger slice of the December ad revenue pie. 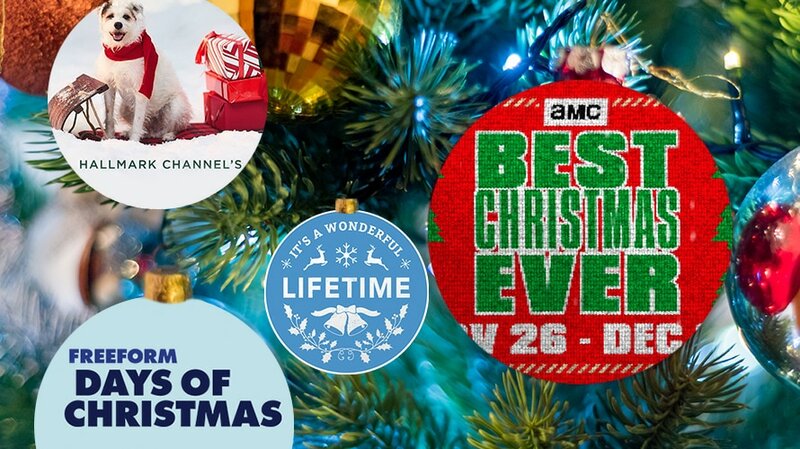 AMC’s Best Christmas Ever, running from Nov. 26-Dec. 25, offers up more than 600 hours of films and specials (including holidays classics like Elf and The Polar Express, which used to air on Freeform). Lifetime is countering with It’s a Wonderful Lifetime, which began Nov. 12 and nearly triples its original holiday film output, to 23 movies this year, along with all-day movies for six weeks. Food Network is doubling its number of holiday-themed shows this year, offering 40 hours in November and December. And for the second year, Disney has expanded 25 Days of Christmas—a December mainstay on Freeform (previously ABC Family) since 1996—to include ABC, Disney Channel, Disney XD and Disney Junior. 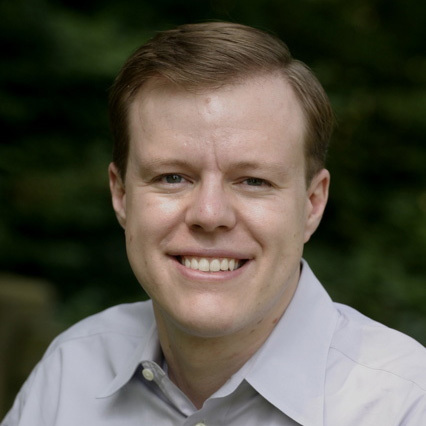 After all, an all-holiday format results in big audiences and a fourth-quarter ad revenue windfall. Hallmark was the No. 1 cable network among women 18-49 and 25-54 during last November and December; its Countdown to Christmas, along with the holiday event from sister network Hallmark Movies and Mysteries, brings in a third of Hallmark’s annual ad revenue. Freeform’s 25 Days of Christmas and November’s Kickoff to Christmas, meanwhile, represent more than 30 percent of that network’s yearly ad haul. A new Tapestry Research study, commissioned by Disney, found that 54 percent of people say they pay more attention to advertising in holiday programs, and half are more likely to purchase products seen in holiday programming. Similarly, Olsen said that It’s a Wonderful Lifetime was one of A+E’s main revenue drivers in this year’s upfront, and he’s already having “early conversations” about getting clients involved with Lifetime’s 2019 holiday movie output. That’s why the increased competition didn’t dent Hallmark and Freeform’s holiday upfront haul, which was as strong as ever. “The bottom line with holiday audiences is people love to celebrate the holidays, and there is plenty of audience to go around. 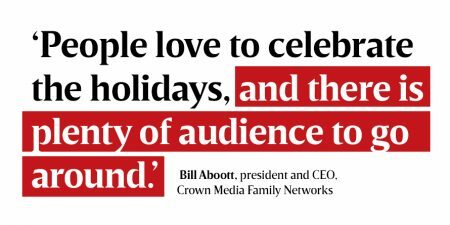 We don’t view it as a zero-sum game, that more competitors means less viewership,” said Bill Abbott, president and CEO of Hallmark owner Crown Media Family Networks. 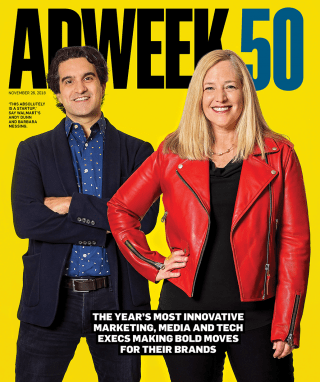 This story first appeared in the November 26, 2018, issue of Adweek magazine. Click here to subscribe.